Not one, but five groups of islands, French Polynesia sprawls across 4,000 square kilometres of the Central Pacific. From the forest-clad peaks of ‘high islands’ like Tahiti to the turquoise necklace of coral atolls draped through the Tuamotu Archipelago, this is Paradise in many beautiful guises. Our French Polynesia holidays feature three contrasting experiences. In the Society Islands, we can whisk you off to the dreamy islands of Moorea or Bora Bora, sleeping above a coral lagoon in a luxurious ‘suite on stilts’. Tahiti offers equally enticing accommodation, plus a line-up of adventures ranging from 4WD safaris to a cultural tour of Pape’ete. If you’re looking for a voyage of discovery, however, step aboard the Aranui V on one of our fabulous small-ship cruises through the remote and little-visited Marquesas. Formed over a million years ago, when two oceanic volcanoes emerged above the Pacific close enough to form a single island, Tahiti has a distinctive figure-of-eight outline. The highest peak, Mount Orohena reaches 2,241m, its flanks gouged by rainforest-cloaked valleys that sweep down to black-sand beaches and sheltered blue lagoons. The cultural heart of the Society Islands, Tahiti has a contemporary Polynesian buzz, particularly in the lively capital of Pape’ete. There’s big-wave surfing at legendary breaks like Teahupoo, world-class diving and whale watching, as well as 4WD tours into the mountainous interior. Less than 20km from Tahiti, this gem of an island is more mellow than its big sister. The soaring peaks are equally spectacular, but Moorea trumps Tahiti with its idyllic turquoise lagoon and white-sand beaches. This might just be the Pacific island paradise you’ve been dreaming about. Just when your heart is set on Moorea, up pops Bora Bora with an even bigger, bluer lagoon… an irresistible swirl of turquoise and indigo draped around a central island of jungle-clad basalt spires. Heaven for honeymooners, Bora Bora is also the perfect match for adventure seekers looking for diving, snorkelling, sailing, 4WD tours and hiking. A world away from the luxury resorts and languid lagoons of Moorea and Bora Bora, the Marquesas are brooding, majestic… a chain of 12 mountainous islands jutting sharply above the indigo-blue Pacific. Riven by rainforest-smothered canyons and fringed by sea cliffs and a chiselled coast of white- and black-sand beaches, this far-flung archipelago (one of the most remote in the world) is a paradise worth seeking if you love nature or hiking. 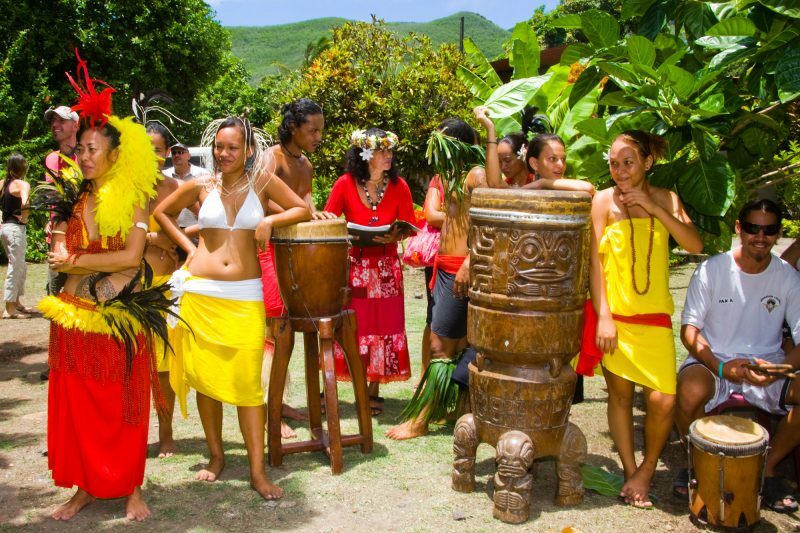 The Marquesas are also steeped in Polynesian culture. Beautiful carvings, jewellery and tattoos are traditional hallmarks, while the islands also boast fascinating archaeological sites and a rich culture of dancing, festivals and story-telling. A great way to experience the island’s traditional vibe and meet its friendly locals is onboard the Aranui V. The so-called ‘Freighter to Paradise’ is part mini-cruise-ship, part supply vessel, sailing between the islands delivering passengers and supplies. We offer cruises year round, lasting 7-14 days.